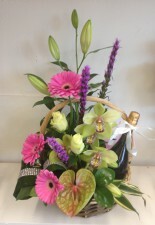 Four Seasons Florist in Wigan, St Pauls Avenue has been providing beautiful quality fresh flowers for over 20 years. We serve the people of Wigan, as well as customers from all over the country. We provide beautiful fresh flowers, which we get delivered on a daily basis, for all occasion and we specialise in funeral flowers. We provide free local delivery and just a small charge for other areas. Our flowers are excellent quality, our services are second to none and our prices are really competitive and excellent value for money. So feel free to phone or pop in for a no obligations quote and we will be happy to help or just give some friendly advice. Looking forward to hearing from you, no matter how big or small your requirements may be. Copyright Four Seasons Florist 2019©. All Rights Reserved.